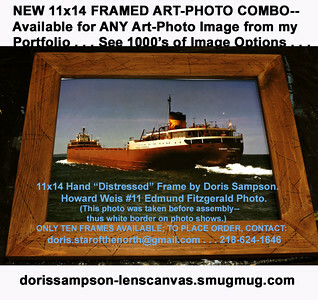 BEAUTIFUL 11x14 FRAMED ART-PHOTO PRESENTATIONS created by Doris Sampson's own hand! These are very special "Special-Order" items...choose from your favorite Art or Photo Giclee Reproductions! DORIS SAMPSON'S HAND DESIGNED, DISTRESSED & EMBELLISHED 11x14 REAL WOOD SERIES PRESENTATIONS! Beautiful Image Suggestions herein to choose from, or pick from ANY IMAGE you find here in the Artist-Photographer's Website! ALL THE FINISHED ITEMS YOU SEE BELOW WERE DONE DURING 2015. NEW FOR 2016, I discovered delicate, decorative wood cut-outs in packages of quantities; and bought several packages to cover corners before I stain the frames and add hand-made embellishments! ALL THE FINISHED ITEMS YOU SEE BELOW WERE DONE DURING 2015. 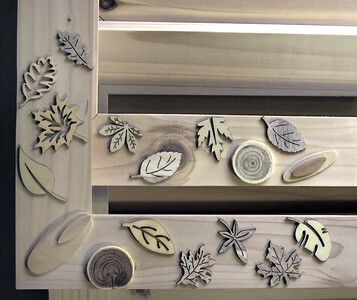 NEW FOR 2016, I discovered delicate, decorative wood cut-outs in packages of quantities; and bought several packages to cover corners before I stain the frames along with the embellishments! REQUEST: 11x14 BASIC FRAME-DISTRESSED, Color #2BU / 11x14 Image, "Deliverance from the Storm" (ARMCO). Artist-Direct @ $79.95 (If applicable, add your total local MN Sales Tax. Plus S&H (undetermined yet). The Distressed-Only Frame shown is a Sample of the Color# noted above. Every Frame is Original; as all Stain and Embellishment Applications are by hand by Doris Sampson. Frames are made upon receipt of Orders that include instructions for Image & Matting (or not) choices. 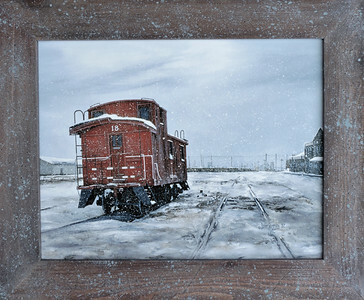 REQUEST: 11x14 DISTRESSED-EMBELLISHED "SNOW SQUALL" / 11x14 Image..."LST&TR, Red Wood Caboose"; Superior, Wisconsin 1982. Artist-Direct @ $94.95 (If applicable, add your total local MN Sales Tax. Plus S&H (undetermined yet). 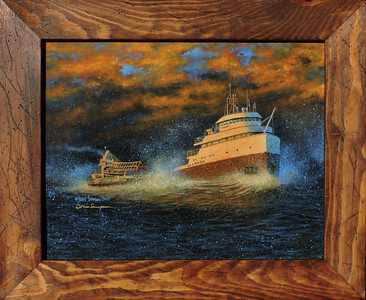 "SNOW SQUALL" represents a second step of Hand Embellishment by Doris Sampson; thus the $15.00 increase in Price for 2 or more additional steps in the creation of this Frame. 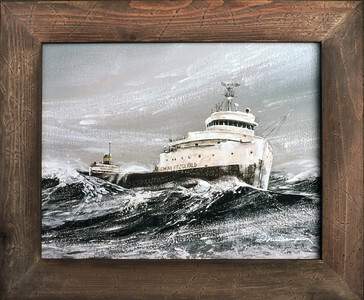 The "SNOW SQUALL" Frame shown is a Sample. 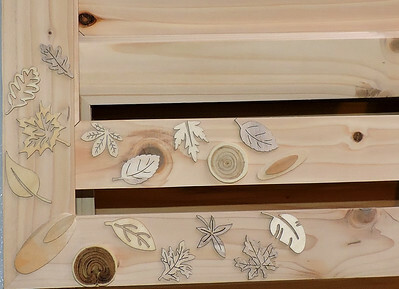 Every Frame is Original; as all Stain and Embellishment Applications are by hand by Doris Sampson. Frames are made upon receipt of Orders that include instructions for Image & Matting (or not) choices. 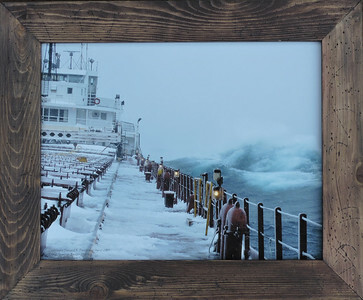 REQUEST: 11x14 BASIC FRAME/DISTRESSED "DARK WALNUT" w/11x14 Image; "DELIVERANCE FROM THE STORM" (Armco). Artist-Direct @ $79.95. (If applicable, add your total local MN Sales Tax. Plus S&H (undetermined yet). 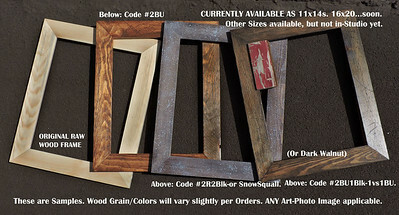 The Distressed-Only Frame shown is a Sample of "DARK WALNUT" . (As yet unvarnished in this photo.) 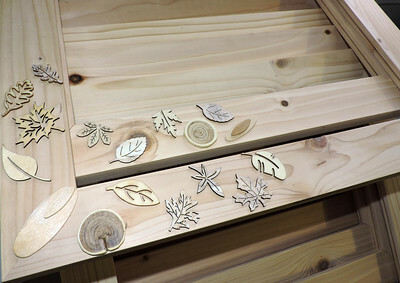 Every Frame is Original; as all Stain and Embellishment Applications are by hand by Doris Sampson. Frames are made upon receipt of Orders that include instructions for Image & Matting (or not) choices. IMPORTANT ALLERGY NOTE: All color stains are made with Acrylic Artist's Paints; and MinnWax Satin Varnish used is latex-based. No petroleum products are used; so there are no such fumes to out-gas to be problematic for sensitive individuals. THESE FRAME PRESENTATIONS ARE ONLY AVAILABLE IN 11x14. If I ever learn about a crafter who makes these frames, and in different sizes, I would make the larger size/s also. 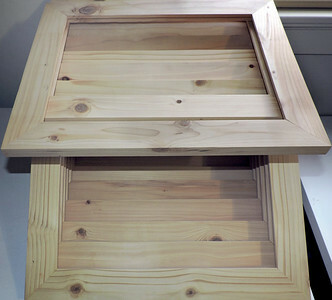 I would like to find a woodworker who could make this frame in 16x20. If you know someone, contact: doris.starofthenorth@gmail.com . This close up is enhanced by the fact that light was coming through a nearby window, which gave the pieces a shadow effect. However, this serves the purpose to show something about how these decorations may look once I've stained the hand-distressed frame. The pigment in my wash of watered down acrylic paints (not petroleum based stain) will soak into cracks and such; and this type of effect will occur. 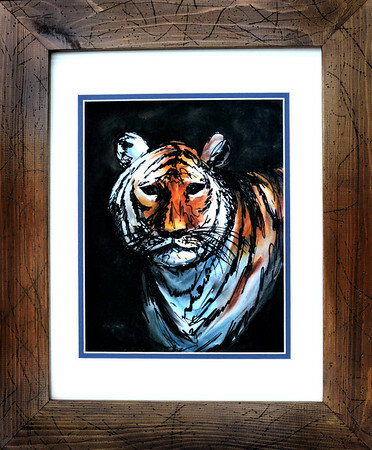 REQUEST: 11x14 BASIC FRAME-DISTRESSED, Color #2BU / 11x14 Image, "Tiger!" - D.S.Vertical. Artist-Direct @ $79.95 (If applicable, add your total local MN Sales Tax. Plus S&H (undetermined yet). REQUEST: 11x14 DISTRESSED-EMBELLISHED "SNOW SQUALL" / 11x14 Image..."BIG WAVE! "/DONALD F. DONOVAN Photo. Artist-Direct @ $89.95 (If applicable, add your total local MN Sales Tax. Plus S&H (undetermined yet). 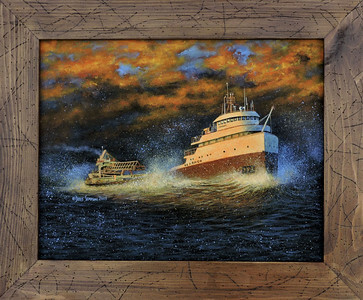 "SNOW SQUALL" represents a second step of Hand Embellishment by Doris Sampson; thus the $10.00 increase in Price for 2 or more additional steps in the creation of this Frame. 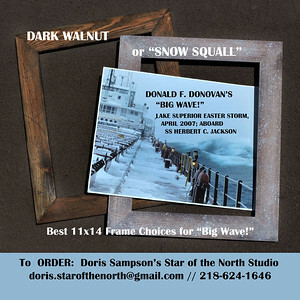 The "SNOW SQUALL" Frame shown is a Sample. Every Frame is Original; as all Stain and Embellishment Applications are by hand by Doris Sampson. Frames are made upon receipt of Orders that include instructions for Image & Matting (or not) choices. REQUEST: 11x14 BASIC FRAME/DISTRESSED "DARK WALNUT" w/11x14 Image; "TIME'S RUNNING OUT" (DS-CPMM-EF). Artist-Direct @ $79.95. (If applicable, add your total local MN Sales Tax. Plus S&H (undetermined yet). 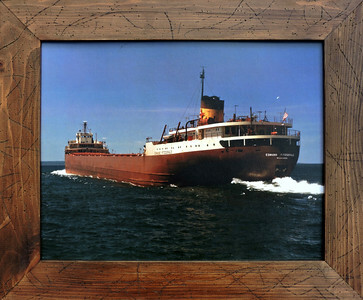 The Distressed-Only Frame shown is a Sample "DARK WALNUT". Every Frame is Original; as all Stain and Embellishment Applications are by hand by Doris Sampson. Frames are made upon receipt of Orders that include instructions for Image & Matting (or not) choices. 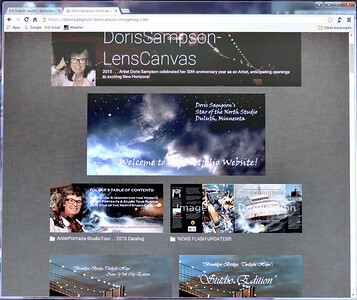 www.dorissampson-lenscanvas.smugmug.com . . . ALMOST ANY IMAGE IN MY WEBSITE CAN BE CHOSEN TO PRINT FOR ONE OF THESE 11x14 FRAME PRESENTATIONS! The Image should be adjustable to crop into an 8x10 or 11x14 aspect ratio (appropriate shape). Each Folder on the Home Page contains Galleries of Art-Photo Images...THOUSANDS from which to choose! This photo really shows how very flat and delicate these pieces are! I was so thrilled to find them because sometimes commercial wood frames can have corners that are not 100% perfectly mitered. My decorative effects will solve that problem with this occurs. But I'll be doing this on all the frames anyway, unless someone requests no elaborations. REQUEST: 11x14 BASIC FRAME/DISTRESSED "DARK WALNUT"; 8x10/11x14 White Dbl.Mat--Black Inner Mat can be requested.) "TIGER!" D.S. Vertical. Artist-Direct @ $79.95. (If applicable, add your total local MN Sales Tax. Plus S&H (undetermined yet). The Distressed-Only Frame shown is a Sample of "DARK WALNUT" (with varnish). Every Frame is Original; as all Stain and Embellishment Applications are by hand by Doris Sampson. Frames are made upon receipt of Orders that include instructions for Image & Matting (or not) choices. REQUEST: 11x14 BASIC FRAME/DISTRESSED "DARK WALNUT" (Raw Umber) / 11x14 Image..."BIG WAVE! "/DONALD F. DONOVAN Photo. Artist-Direct @ $79.95. (If applicable, add your total local MN Sales Tax. Plus S&H (undetermined yet). REQUEST: 11x14 BASIC FRAME/DISTRESSED "DARK WALNUT"; 8x10 Image / 11x14 Black Mat. "TIME'S RUNNING OUT" (DS-CPMM-EF). Artist-Direct @ $79.95. (If applicable, add your total local MN Sales Tax. Plus S&H (undetermined yet). The Distressed-Only Frame shown is a Sample of "DARK WALNUT". Every Frame is Original; as all Stain and Embellishment Applications are by hand by Doris Sampson. Frames are made upon receipt of Orders that include instructions for Image & Matting (or not) choices. 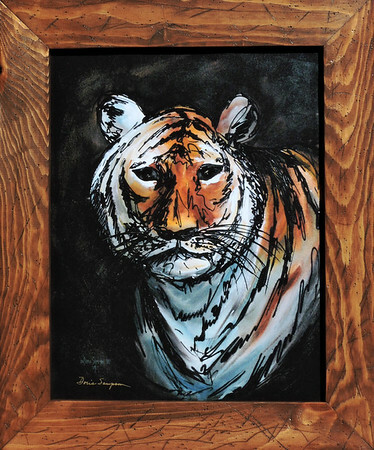 UPDATE FEB. 6, 2016: I just bought a dozen new 11x14 wood frames and can hardly wait to turn them into works of art! REQUEST: 11x14 BASIC FRAME-DISTRESSED, Color #2BU / 8x10 Image, 11x14 Black Single Mat. 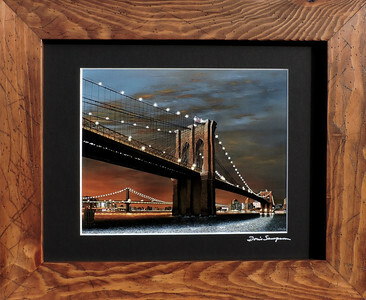 "Brooklyn Bridge, Twilight Hope" STUDIO EDITION: Artist-Direct @ $79.95 (If applicable, add your total local MN Sales Tax. Plus S&H (undetermined yet). 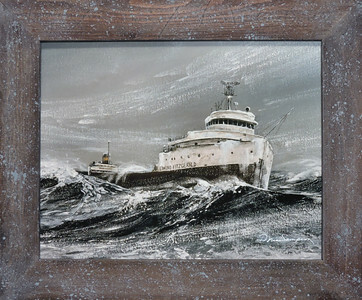 REQUEST: 11x14 DISTRESSED-EMBELLISHED "SNOW SQUALL" / 11x14 Image..."Time's Running Out" (DS-CPMM-EF). Artist-Direct @ $89.95 (If applicable, add your total local MN Sales Tax. Plus S&H (undetermined yet). REQUEST: 11x14 BASIC FRAME/DISTRESSED "DARK WALNUT"; 11x14 Image, Cat.# HW-EF-11. Artist-Direct @ $79.95. (If applicable, add your total local MN Sales Tax. Plus S&H (undetermined yet). 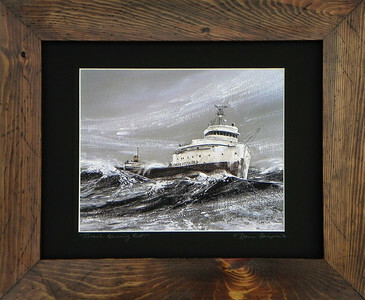 The Distressed-Only Frame shown is a Sample of DARK WALNUT. (The way the wood soaks up the color wash can alter colors across the frame. However, this one may have started with one brown, followed by a wash of a redder brown.) Every Frame is Original; as all Stain and Embellishment Applications are by hand by Doris Sampson. Frames are made upon receipt of Orders that include instructions for Image & Matting (or not) choices.